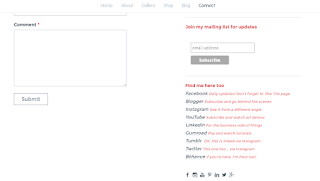 I will give a breakdown of the navigation on this blog post. This is the HOME page. You can arrive on this landing page from many sources like a QR code or a link from the internet. You will be introduced to my logo right at the top where the texture will change from time to time. The animated gif, too, that takes centre stage will be replaced with new images every now and then. This home page will evolve eventually, I may insert important news bites or things like a running ticker at the bottom. So keep checking. And of course I have the navigation part. 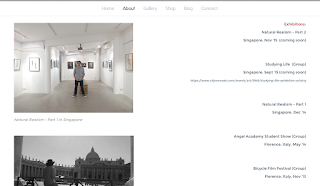 The other 5 categories are ABOUT, GALLERY, SHOP, BLOG [you're looking at it now :) ] and CONNECT. This page tells you about my journey from Graphic Design to Painter and all the juicy bits in between. This could also double up as a Media Kit and resume. Some photos are also added to show snippets of my journey. 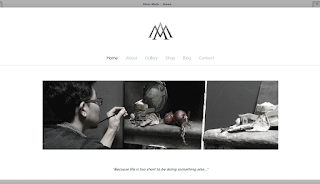 This page is why this website was built in the first place - to showcase my work. 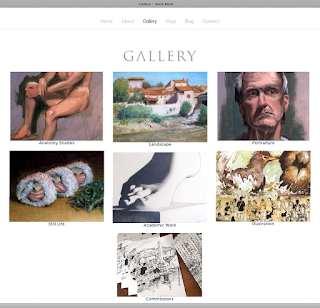 It is broken down into 7 categories: Anatomy Studies, Plein Air, Portraiture, Still Life, Academic Work, Illustration, and Commission. 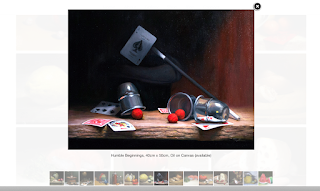 Clicking on each image you will take you to a sub-page within the gallery to view individual works. Here's an example of what you might find inside (for example) the STILL LIFE sub category. The next page is my SHOP. 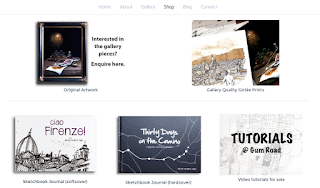 Here is where you can buy original work, high quality prints (from Society 6), books or the tutorials I have made. Every cent you spend on this page supports my journey as an artist: Studio bills, model fees, art materials, upgrading skills, exhibitions, brain food, etc. This last page is where you contact me and make enquiries should you be interested in buying my art or hiring me as an artist. You can also find links to follow me wherever you can on the various social media sites.